The Jumpsport Fitness Foldable Trampoline 350F provides excellent stability and its rubber cord suspension ensures gentle exercise. There are 2 levels of tension of the cords to choose from, so that the rebounder can be adjusted to meet your own personal training needs. This rebounder is also available as folding and thus easy to transport folding version. 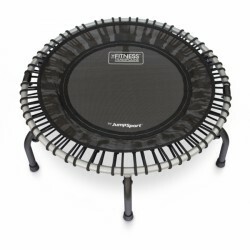 The JumpSport Fitness rebounder model 220 is perfect for starting fitness training at home. The elastic cords' suspension makes the training very joint-gentle. Thanks to curved legs and nonslip rubber caps, the rebounder is always stable. 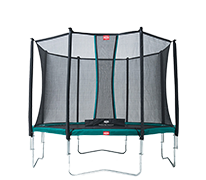 The Jumpsport Fitness Trampoline Model 350 provides excellent stability and its rubber cord suspension ensures gentle exercise. There are 3 levels of tension of the cords to choose from, so that the rebounder can be adjusted to meet your own personal training needs. 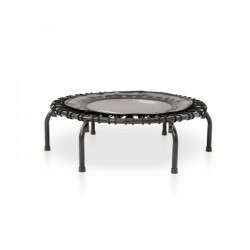 This mini trampoline is also available as folding and therefore easy to transport version. The Jumpstart Fitness 220 was very easy to assemble. It only took me 5 minutes. The model seems to be very well constructed and sturdy. It is large enough to do its job well, yet it's compact enough to store away when not in use. It is light to carry as well, even for someone of my age,72. The bounce is gentle , not jarring, and it is very quiet in use. Both my daughter and myself are using it everyday and we have already lost inches from our legs and waist. It is so pleasant to use that we want to use it as much as possible. For us there are no disadvantages to this product. Very well made piece of equipment and helpful customer support. I decided to order the support bar and managed to order one for a different model. Customer Services noticed this even though it was a later order and alerted me to it. Subsequently they immediately offered a refund and to alert me when the appropriate bar comes into stock. An excellent purchase. I needed to buy a new rebounder after wearing out my previous one. It was a cheap model with springs so wanted a quiet, good quality product. The sportjump 220 is perfect. Excellent quality, super quiet and so much better than a sprung rebounder. Great fun to use and at a really good price. I find it difficult to find time to go to they gym so 10-20 mins on this morning and night gets the body working, brilliant. This rebounder is amazing for the size and is virtually silent when being used. The legs do not fold-away, so before purchasing make sure you have somewhere to store it with the legs screwed in. The bounce is deeper and softer than most other makes of rebounder so you get a really good work-out without the trauma to your joints. Easy to put together (less than 10 minutes). Bought to replace a cheap spring re-bounder which it easily out-surpasses. The build quality is excellent and the design makes it very stable in use. The bungee cords create a much gentler (on the joints) bounce and it is so quiet in use that you can easily use it whilst watching television whilst still burning calories and getting fitter. Rebounder arrives ready to use, it just needs the legs attaching which takes only 10 minutes. It is very quiet to use and there are loads of routines available on the internet. It is also loads of fun. product is good quality, very sturdy. ive not used these before and wanted one that was quiet, which does the job great. recommended. JumpSport has built rebounders of high quality and with perfect jump features since the middle of the 90s. The brothers and sisters Mark and Valerie Publicover developped rebounders with the principle to create save rebounders for every age. At first, they concentrated on rebounders for outdoor use, however they discovered quickly an improvement regarding the previous steel springs - the rubber ring suspension. The rubber ring suspension JumpSport allows a very joint-gentle training. Either light swinging, running or intensive power workouts, the variety of use is enormous. Being even used for rehab, rebounders with rubber ring suspension are a popular buildup device. The suspension of JumpSport rebounders is adjustable. Knots in the rubber rings allow the adjusting of the hardness level. According to bodyweight or training target, you can vary the resistance. The rubber ring is just hooked in the clip once the length is changed. Some of the models are foldable, it means, they are equipped with two hinges in the metal frame. Due to those hinges, the required space is reduced. Just open the two small metal brackets first and press the rebounder together in order to fold it. Rebounder jumping increases your quality of life with fun and frequently unconscious training. Health and fitness are actively support by rebounder jumping, the training is joint-gentle and strengthens the connective tissue. Studies prove that up to 70% more muscle fibres are demanded while jumping on a rebounder than for doing common jogging. The literally "joyful side effect“ is the release of endorphins, happiness hormones. 70% more muscle demand, happiness hormones, and joint-gentle training - rebounders.